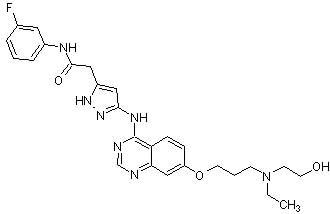 Potent, selective Aurora B kinase inhibitor (IC50 = 0.37 nM). Induces apoptosis in vitro. Antitumor agent. Cell-permeable. Active in vitro and in vivo. Publishing research using ab142049? Please let us know so that we can cite the reference in this datasheet. There are currently no Customer reviews or Questions for ab142049.